Two diplomas awarded to Isaac T. Goodnow. 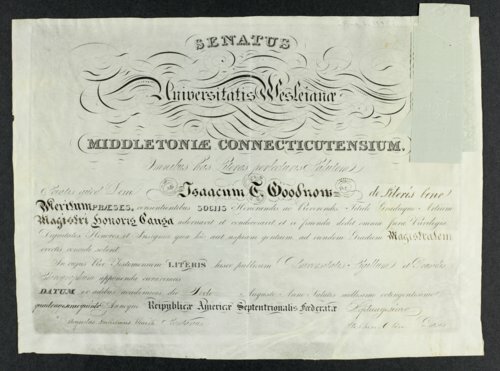 In August 1845, Goodnow received a teaching degree from Wesleyan University in Middleton, Connecticut. Goodnow came to Kansas in 1855 with the New England Emigrant Aid Company to ensure Kansas become a free state. They built a community, which would eventually become Manhattan, Kansas, and founded Bluemont Central College. In June 1889, Goodnow received a doctorate in philosophy from Baker University in Baldwin City, Kansas.